Posted by Caitlin Mulkeen on Mar, 18 2019. Last weekend’s tragic Ethiopian Airlines crash involving Boeing’s 737 Max 8 airplane, the most popular commercial airliner in the world, may have wide-ranging effects depending on the length of the grounding. Following the crash dozens of nations ordered the grounding of the 737 Max jet which will mean problems for airlines and supply chains. Airlines now have a more limited fleet to work with and are facing short-term operational challenges, particularly in areas where Max flights are concentrated in one city or route. Analysts say North America will face the most disruption as Southwest Airlines, Air Canada and American Airlines are the three largest operators of the jet. According to Barron’s, Southwest (LUV) has the most exposure to the aircraft of all of the major airlines, with 34 of the planes in service. However, according to Tracy Stewart, content editor at Airfarewatchdog, there were only 350 Boeing 737 Max 8s in service globally, so there is hope that airlines will bounce back and fallout will be somewhat limited. Boeing has said it has paused deliveries of the jet and flights won’t resume until the planes receive updated flight-control software. However, not all of the effects will be bad, and supply chains could benefit. According to Bloomberg Intelligence analyst Douglas Rothacker, carriers may turn to older aircraft to maintain capacity, and could require more maintenance and repair work, which is the biggest profit driver for most suppliers. 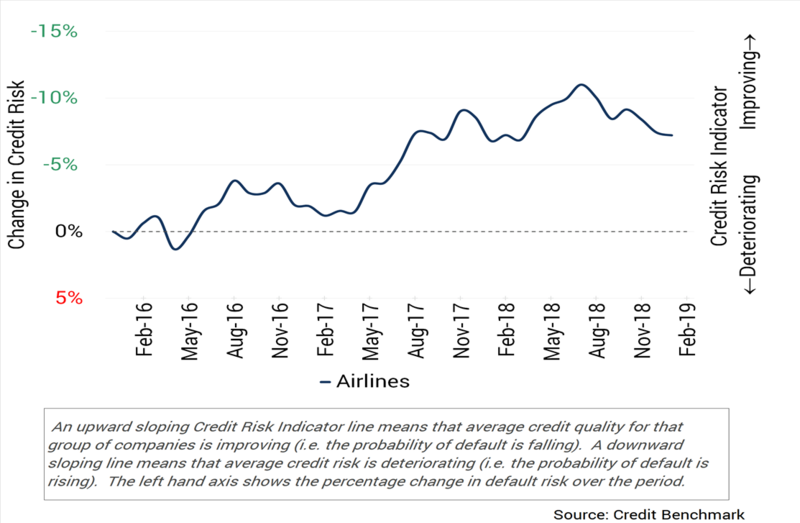 The chart below is based on Credit Benchmark’s credit risk data on 102 airline companies and subsidiaries globally, sourced from 30+ of the world’s leading financial institutions. The airline industry has posted a moderate (10%) credit improvement since 2016, and overall passenger demand continues to grow. But there has been a noticeable credit pullback since the middle of 2018 as the benefit of weaker oil prices has largely run its course. Against this backdrop, the Boeing 737 issue is likely to be a significant additional short-term negative for some industry members.